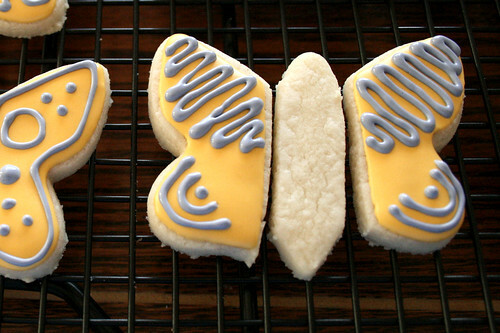 Frosting For the Cause: Butterfly Garden Cookies. The following is my post as guest-host on Frosting For the Cause for Monday, March 14th. I wanted to keep a record of it here in my blog as well. I was remiss in my earlier post, but I want to sincerely thank Paula for putting together such a wonderful, hopeful, inspiring Cause for us all to participate in. She is just a dream to work with, and so very, very sweet. We wouldn’t be here without her, sharing ours stories of love & hope! When I signed up to “bake for a difference” way back in late December, I knew immediately who I wanted to honor with my post. I’ve been waiting three long months to have this chance, and I do hope you’re ready to meet her. I’ve got a very special lady in my life, and we have a very special friendship. 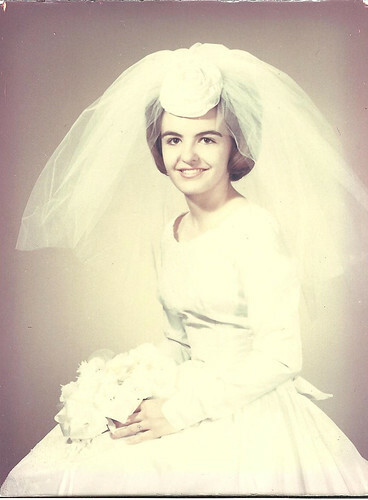 In your first guesses, you’d probably not guess this woman, if nothing else than for our relationship alone. You see, the sweet SuperWoman that I know and love so dearly is my mother-in-law. Nancy. The name means “gracious,” and she is certainly every bit that. She is the church organist that has put in thousands of hours over her 40+ years of service, the nurse that has held hundreds of hands while caring for the sick & the dying, the mother that has raised three stubborn boys and always has spaghetti ready for dinner on Thursday nights, the grandmother of six that always has time to read a book aloud & sneak a bit of chocolate to them, and she is the loving wife to George, her husband of almost 46 years. She is a friend to all she meets, and she is a prayer warrior for them, as well as strangers she’s never met. She has no enemies because all who meet her love her (though she will tell you she dislikes the deer that feast on flowers in her backyard, she still will pause to admire them from her kitchen window!). She is one of the most stunningly beautiful people – both inside & out – you could ever hope to meet. She is also the biggest fighter I’ve ever met. They say that “God won’t give you more than you can handle,” and Nancy is proven to be one of the strongest women I’ve known, for she sure seems to “handle” a lot of impossibly tough situations. 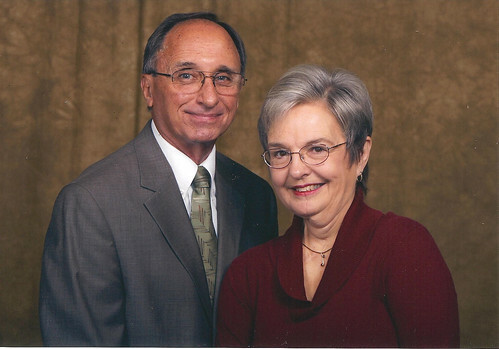 When her youngest (my husband) was only 3 years old, Nancy was diagnosed with Squamous Cell Carcinoma. She was given a 50/50 chance to live, but that wasn’t good enough for her, and she refused to give up! She always told people that she didn’t want anyone else raising her baby, and she meant it! She tells a story of my husband when he was little that I love. On a roadtrip, the family stopped on the side of the road to let him do his business. Just as he positioned himself at an embankment and began, he scared a flock of butterflies into rising. He hadn’t seen them before, but they soon filled the air and covered the skies – happy, bright yellow butterflies! 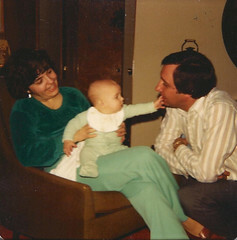 When days were hard, Nancy would always tell my husband to, “Remember the butterflies!” and he would cheer up. Thank goodness too, for I can’t imagine the man my husband would’ve grown up to become with her loving influence in his life. Now, 28 years later, she is still going strong! In the last few years, however, she’s faced an even bigger hurdle – helping my father-in-law, George, to fight his own severe cancer. It has been a long 5-year battle, and his fight has become hers to keep his hope & spirits alive. She wouldn’t trade a moment away, though, for her love runs so very deep. I’m sure that George has been blessed with his own angel here on Earth. 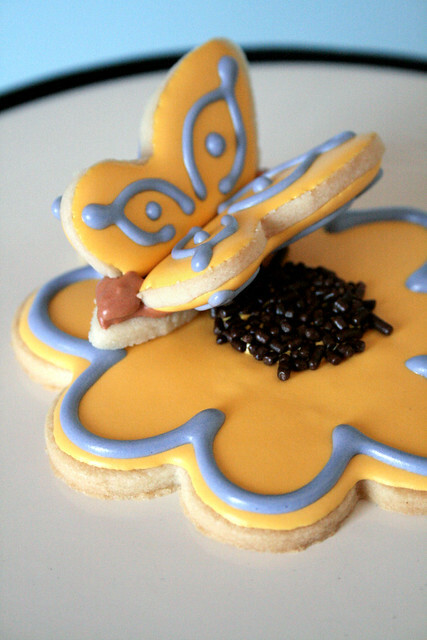 When I asked my husband what type of cookie he thought would be best to honor his mom, he answered immediately: “Remember the butterflies! Oh, and make sure they’re yellow.” Absolutely, I could think of nothing better! 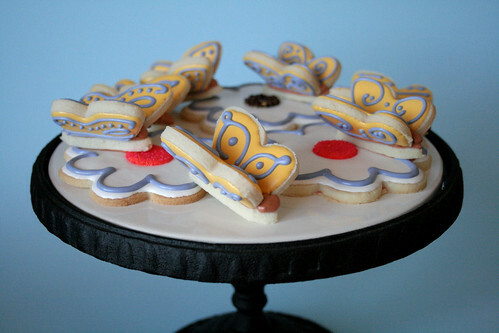 Making these cookies involves making two kinds of cookies, as well as “assembling” a butterfly cookie to be used as a topper. I promise it is easier than it sounds! 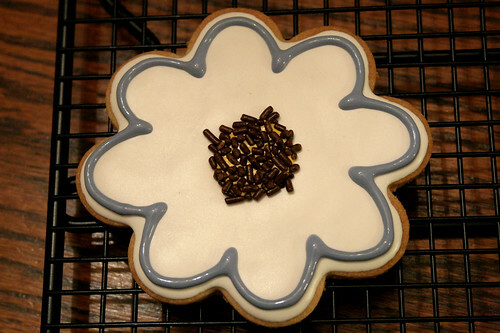 To get started, I used the same dough & icing recipes as included in this post, so please check over there for the steps up until you are ready to cut your cookie dough into shapes. 1. 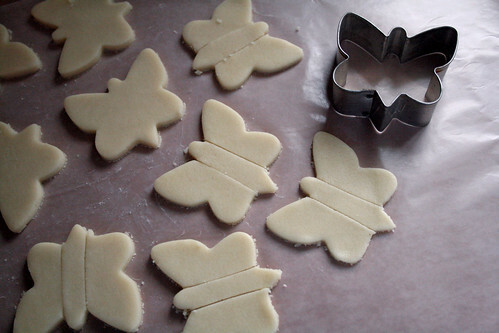 Cut small butterfly shapes into dough. I used my smallest butterfly cutter, about 2″. Using a small, sharp knife, slice the dough into two wings & body sections. 2. 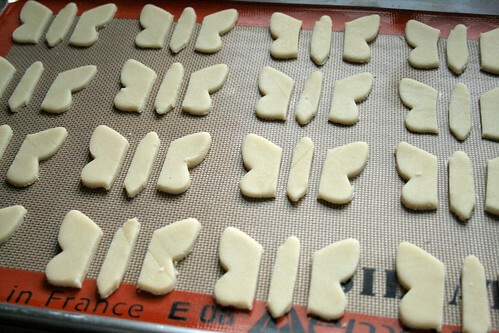 Place all the butterfly pieces on baking sheet. 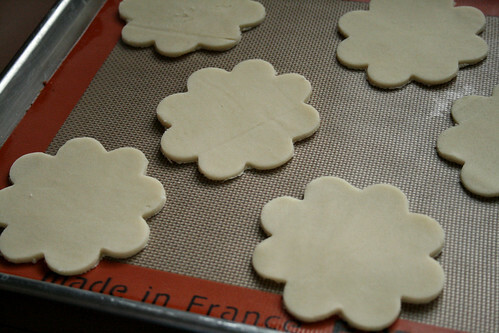 Change baking time to 7-8 minutes at 365° so the edges do not burn. 3. 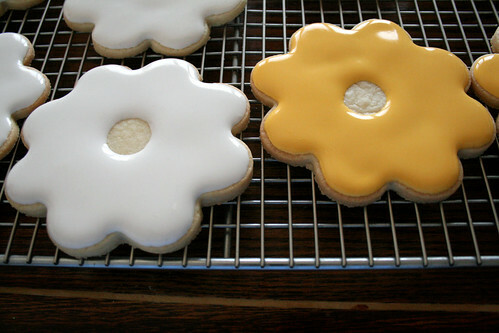 Cut large flower shapes in dough, and bake these for the normal 9-10 minutes at 365°. 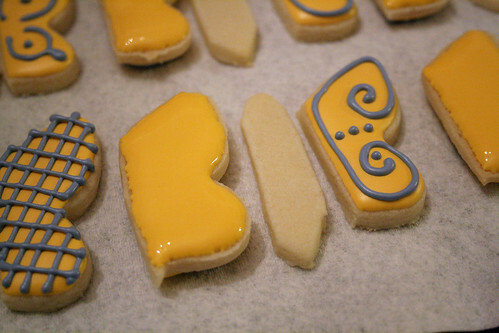 Cool all cookies completely. 4. 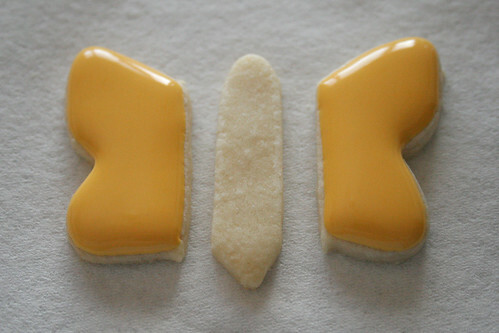 Using “9-second” yellow fitted with a #2 tip, pipe the border of the butterfly wings. 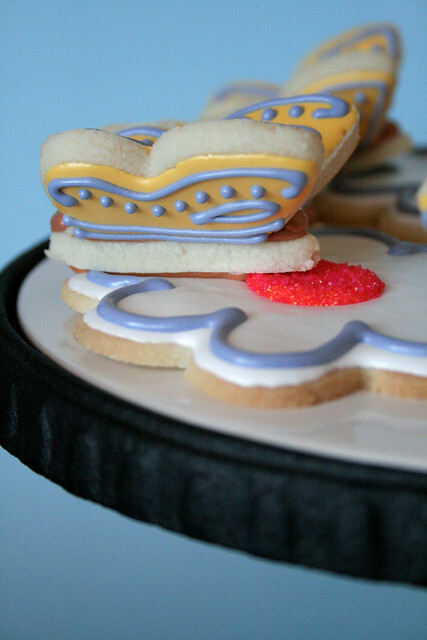 Immediately fill in with more icing. (This prevents a piping “line” from showing.) Allow to dry for an hour. 5. Using both “9-second” white & yellow fitted with #2 tips, pipe borders on the large flowers. Pipe a circle in the center (to be left blank for now), and immediately fill in the rest of the shape with more icing. Allow to dry completely. 6. Now that the wings have had some time to ‘set,’ you can add the decoration. Using “P” blue fitted with a #1 tip, pipe decorations on the wings. Make sure to decorating mirrored pairs for each butterfly. Allow to dry completely. 7. Several hours later, when your wings are completely dry, turn over one wing in each matching pair. (Doing this enables you to see the pattern you need to duplicate.) Using “9-second” yellow fitted with a #2 tip, pipe a border on the backside of the first wing, and then immediately fill in with more icing. Let dry an hour before continuing to decorate. Using “P” blue fitted with a #1 tip, replicate the pattern on the back of one wing first; next, flip the second wing in each pair over as well, and decorate it to match. Let dry completely. 9. Using “P” blue fitted with a #2 tip, pipe a border near the flower’s edge for decoration. Let dry completely. 10. Using completely-dried parts, begin constructing your butterflies. I laid a towel across my table, then placed a yardstick down the center of it. Using “P” brown fitted with a #2 tip, pipe & fill in the body section of the butterfly and place it on the yardstick. Immediately prop the wings into the wet body, propping up with toothpicks to dry.. (The terrycloth towel helps to keep the toothpicks steady. 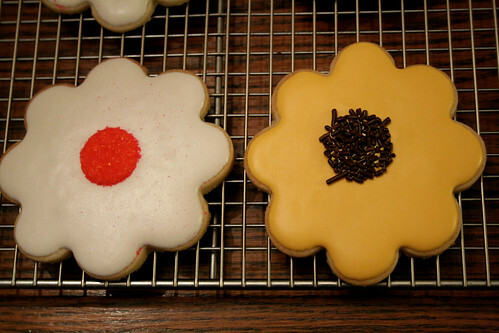 Add extra brown icing at the head & tail to secure cookies. Let dry overnight. 11. 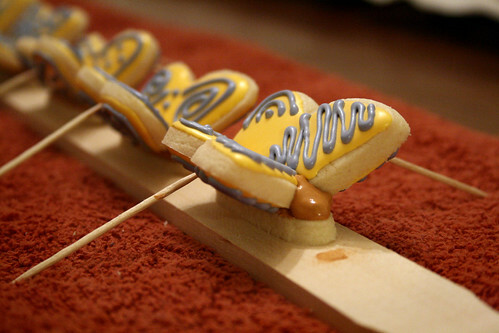 The next day, using “P” brown fitted with a #2 tip, pipe a thick line of icing at on the underside of the butterfly’s body, and carefully place the butterfly onto a flower cookie. Let dry for several hours before moving. And that’s it! Enjoy your beautiful butterfly garden, and share your treats with others! 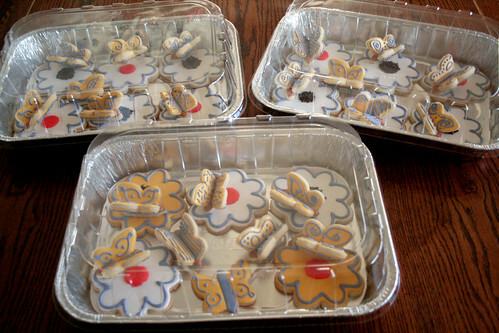 These are more difficult cookies to package, though – even the largest cellophane bag that my local Hobby Lobby stocks won’t cover them, and I think they would be susceptible to easy breaking as well. Instead, I packaged these six-to-a-pan in disposable cake tins (with lids), and I will deliver them this way to my local cancer care treatment center. « Frosting For the Cause: St. Paddy’s Day Cookies. These are just absolutely stunning!!! WOW! Thank you so much! The 3-D aspect makes them so much more fun, I think. That, and I dearly love the lady I made them in tribute to. WOW! Your butterfly garden is absolutely darling, and I’m so impressed with the tutorial–definitely one of the more well-explained I’ve seen. I’m so excited to try these out! Thanks for sharing.